I never would have thought I would some day look back at my twenty years in newspaper sales and be thankful? Selling space in a small town, tri-weekly newspaper was not the easiest thing in the world to do, but I have to admit it was probably easier than selling air space for a radio station. At least with a newspaper you can hold something in your hand. “Working it,” means you’ve got to interact with the crowd. Every person who passes your booth is a potential buyer. Does every festival attendee that meanders by your space pick up one of your books and automatically fall in love with it? No. You have to draw them in, and do some fast-talking. 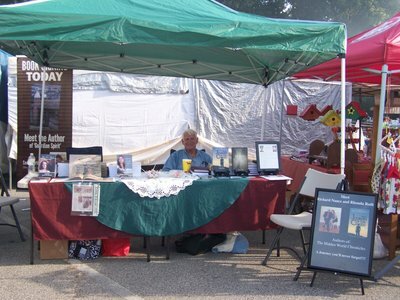 Here are a couple of suggestions: Try to make eye contact as they are walking by your booth, and ask this question, “Do you enjoy reading?” Some will automatically answer, “No.” Others might hem-haw around and say, “Sometimes.” To these you politely say, “Have a nice day” and let them be on their way. But if they answer, “I love to read,” then that’s when you reel them in and start telling them a little snippet about your book, or books. With my children’s picture book I look for potential grandparents, parents of young children, and even expectant parents. You’d be surprised how many mommies and daddies want to buy their unborn child a Christmas present, especially a children’s picture book about the night Jesus was born. Another important thing is to display your work so people walking by can easily see what you’re selling. That means your table needs to be as close to the front of your tent as possible, near the crowd. And, it never hurts to have a bowl of candy sitting mid center either. Make sure your books are the prominent focal point. A fellow author was set up a few tents down from me this weekend. Saturday morning he was complaining about how few sales he had on Friday. I had to be honest with him. I told him I had walked by his booth the previous day and had not even noticed he had books for sale, and he had five displayed. He was also selling framed art so when I strolled by I only saw the pictures in the background, his book covers blended right in with the artwork. I didn’t have time to see if he changed his display, but at the end of the day on Saturday he did report that his sales that day had been great! I think the main thing you have to do to sell books is to be nice to folks, and, of course have written a great story for them to read. Some people just want to meander in and chitchat, others want to tell you their life story, while others trot by in a near run to get by you. Whatever the case, I listen, answer sincerely and show God’s love to all people, whether they buy a book or not. I’ll end with a quick little funny thing that happened this past weekend at The Autumn Leaves Festival. I snagged a lady with the usual, do you enjoy reading, line. She answered, “No, I can’t read.” I answered, “Well, I’ve got a children’s picture book, you can look at the pictures.” Guess what, she walked away with a copy of The Manger Mouse in her hand. My motto: Where there’s a will, there is surely a way.